An interdisciplinary team from the University of the West of England (UWE Bristol) and the Bristol Robotics Laboratory is playing a key role in development of Connected Autonomous vehicles (CAVs) that have the potential to transform the lives of isolated older adults through creation of independent travel options. The 'Flourish' project announced today is co-funded by Innovate UK and involves partners from across the South West who will work together to develop a CAV that integrates the mobility needs of older adults with a secure and connected infrastructure. 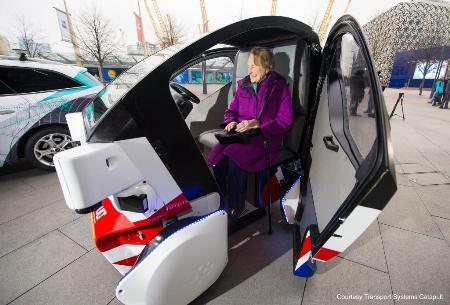 The development has the potential to revolutionise mobility for older adults, reducing loneliness and giving people who do not drive the freedom to make spontaneous choices without relying on others. The work also promises to lead to thousands of new jobs in the South West, in supply chain and product development. Associate Professor Praminda Caleb-Solly from Bristol Robotics Laboratory explains, “Ageing brings a host of physical and cognitive impairments, together with long-term conditions, resulting in the need for added support. Maintaining health and independence, and participating as active members of society, requires people to be mobile. “Studies show that cessation of driving can lead to reduced social activity, poor health and depression. In the UK, over one million older adults say they always, or often, feel lonely. This research would mean that people in this situation wouldn't have to depend on others for transportation and would have the ability to make spontaneous choices. “UWE researchers with expertise in applied psychology and human factors, assistive technology and understanding people's transport requirements, will work with older adults with a range of needs and expectations. The team will also contribute to the design and development (through ongoing human factors testing) of adaptable Human-Machine interfaces (HMIs) which are responsive to people's different accessibility needs. Target-user groups will have a complex range of co-morbidities which can result in impaired vision, loss of hearing, painful or restricted mobility, poor movement control and issues with balance and difficulties with speech, memory and attention, including occasional confusion. Enabling these user groups to communicate intuitively, confidently and safely with an autonomous vehicle requires sophisticated multi-modal interaction capability, and intelligent sensing and responsiveness, which mainstream autonomous vehicles won't necessarily support. The research will address these challenges by building on the teams' world class experience of human factors, assistive technology design and psychology. The findings from working on the simulator development and testing will be transferred to designing the actual physical interfaces which will be integrated into a real pod. A series of physical trials in a range of contexts to test usability and integration with other information sources will then be conducted. Real-world trials with older adults will also assess user experience and user interaction with the human-machine interfaces, focussing on subjective, performance and physiological response measures. Experience of running the trials will enable the development of a standard assessment framework to determine HMI and vehicle adaptations needed for different types of disability needs. This will give car manufacturers incorporating this technology a competitive edge in the market, attracting a wider range of customers and increasing market penetration. The UWE contribution to FLOURISH continues 'the pathway to Driverless Cars' (Department for Transport Feb 2015) building on the platform provided by the VENTURER project and moving closer to the realisation of Connected Autonomous Vehicles (CAVs) sharing roads with current manually driven vehicles and other road users. In FLOURISH, co-designing with people with some level of cognitive and physical age-related impairments, the resulting simulator test environment and adaptable user interface for CAV operation will also be suitable for others with special needs as well as the wider public. As part of their research on assistive robotics for independent living, the Bristol Robotics Laboratory (BRL) at UWE collaborate closely with Designability, who have expertise in developing assistive technologies for older adults, and working with researchers in applied psychology and human factors, will extend their expertise in this area. Professor Tony Pipe from BRL who will research the security systems used to drive the vehicle. Associate Professor Praminda Caleb-Solly from BRL will contribute to the design of the adaptable Human-Machine Interfaces and evaluation studies, investigating innovate ways for visualising data from multiple sources to provide contextually relevant and engaging information to the person in the vehicle, through a range of modalities. Professor Graham Parkhurst and Dr Ian Shergold from UWE Bristol's Centre for Transport and Society will contribute their expertise on older citizens' mobility needs and the importance of being mobile both for practical reasons but also due to the wellbeing benefits of being socially connected through movement. Professor Chris Alford and Dr Phil Morgan from UWE Bristol Department of Psychology will be leading the applied psychology and human factors aspects of the project.